The recent discovery of seven statues in Karma, northern Sudan, south of the Third Cataract, which represented monarchs during the ancient Nubian Kingdom. They represent the kings Taharqa, Tanoutamon, Senkamanisken, Anlamani and Aspelta. The excellent account of the latest excavations from Hierakonpolis has been updated at the Archaeology Magazine website. This issue focuses on the contents of Tomb 9, a Nubian C-Group burial, including an analysis of the tomb's owner herself. The obelisk, currently located in a suburb of Cairo called Mataria, was erected by the 12th Dynasty Pharaoh Senusret I. It is 20.4 meters high and weighs 121 tons. It has been decided to subject it to mechanical cleaning. When Lake Nasser was created, many Nubian monuments were rescued. Others were lost beneath the waters created by the new Aswan Dam. This Al Ahram Weekly article discusses both the prehistory and history of Nubia, and the work done to preserve its heritage. A Providence Journal article about the attitidues of Zahi Hawass to visitors to Egypt. If you need a username and password, use Andie (username) and Gazelle (password). An Egyptian State Information Service item about the planned restoration of Esna temple. The threat comes from a combination of high underground water and the low level of the Nile water in front of the temple caused by the Esna barrages, and sewage from local housing. This is a major project which involves dismantling the temple and raising it on higher ground. The National Geographic have offered a short summary of what is known about the recently discovered Saqqara mummies. The article also discusses Zahi Hawass and his policies re recovering lost/stolen/smuggled artefacts. The Egyptian State Information Service is to commemorate the finding of the Solar Barque: "Commemorating the 50th anniversary of their discovery, the Supreme Council for Antiquities(SCA) is to hold a series of lectures to highlight the historic and archaeological significance of the boats and their religious implications in the ancient Egyptian doctrine." President Mubarak opened the extension to the Luxor Museum, which, kown as the Thebes Glory Hall, examines the military history of Ancient Egypt. Please note - there is also a considerable amount of commentary quoted about political matters. Zahi Hawass's regular article in Al Ahram Weekly continues his description of different aspects of the Pyramid Workers's village at Giza. This week he looks at the number of people employed, how they were managed, and what they ate. A report about a boat chapel found at Dendera earlier this year, discussed in the context of the Dendera site. The Egyptian State Information Service report that the Osirion tomb is under serious threat from groundwater and salt damage, following the findings of a Swiss research team. However, it has not yet been decided how to counteract the problem. The Ptolomaic site of Kom Ombo has been the subject of an extensive restoration project, which is described in brief in this Egyptian State Information Service feature. An article about Egypt's thriving tourist industry. It puts the tourist industry into its political and economic context. This page describes Australia’s first permanent archaeological research facility established in Egypt, and gives an overview of their activities at Helwan - which is helping to clarify the situation from the First to Fourth dynasties, a period of some 400 years. The research is helping to establish how the Egyptian Civilization evolved from Predynastic times through to the pyramid building ages and beyond. A study of insect life at Akehnaten's city Amarna (Akhetaten) has revealed that the place was teaming with fleas, flies, bedbugs and parasites, in particular at the tombuilders "Workmens Village". The study by Eva Panagiotakopulu, a paleoentomologist at Sheffield University (UK) believes that the fossilized plague bacteria she identified in the fossilized fleas may indicate that the plague originated in Africa, in fleas that fed on the Nile rat and were only later transferred to Asian rats as carriers, which in turn communicated the plague to the rest of the Mediterranean. A Polish-Egyptian team has found the remains of the University of Alexandria. It has been found in a part of modern Alexandria where a theatre had already been identified, now thought to be part of the library complex. 13 large auditoria have been found. The University was legendary and texts describe it, but this is the first time that any part of the library has been discovered. Amongst many renowned scholars who worked there were Euclid and Archimedes. "A Belgian archaeological mission to Egypt discovered a Pharaonic housing compound close to a gold mine in mountains along the Red Sea. . . . Mineshafts and holes, with huts for laborers spread around them, were uncovered, in addition to a huge number of stone instruments used to cut the gold-bearing rocks." underground structure dedicated to Osiris. Rushdi Said is something of a personal hero of mine - a geologist who has spent a considerable amount of time writing about the Nile's development since its first creation. This knowledge is central to an understanding of prehistoric contexts and how the behaviour of the river at different times influenced daily life in historical Egypt. This Al Ahram weekly article is an interview with Rushdi Said, and offers a summarised description of the Nile's development. 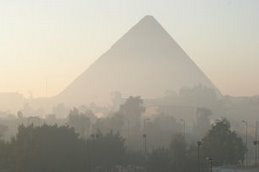 The Egyptian State Information Service has announced that Egyptian tourism has reached record figures. If true, this must be a huge boost after the terrorst strikes against Egypt in the 90s, when some writers speculated that Egypt's tourism would be permanently damaged.